The Joie Every Stage Group 0-1-2-3 Car Seat in Salsa grows with your child from birth to 12 years. This 4-in-1 convertible car seat adapts to fit your child at each stage, meeting every road safety standard you’ll encounter as your little one grows up. Designed and engineered to make growing up easy, the Joie Every Stage Group 0-1-2-3 Car Seat in Red adjusts up and out simultaneously, creating a custom fit for your child. As you raise the headrest through its 10 height positions, the AutoAdjust side wings expand for a perfect fit. The harness system matches the setting of the one-hand adjust headset with no re-threading of the 5-point harness. The Every Stage begins as a rearward facing car seat with 2 reclining positions, suitable from birth to 18kg, before converting to a 4-position recline forward facing seat, suitable for use from 9-36kg. 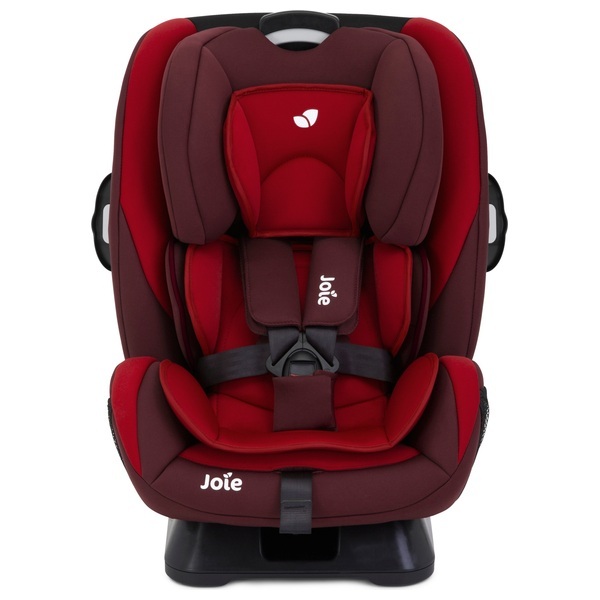 The frame of the Joie Every Stage Group 0-1-2-3 Car Seat in Merlot is reinforced with steel to absorb energy upon impact, while side impact potection keeps your child safe. The additional protection of Guard Surround Safety panels can be individually activated to provide extra room in your vehicle. The Joie Every Stage Group 0-1-2-3 Car Seat in Merlot features well- marked, colour-coded installation paths and dual lock-offs for installation with a vehicle’s 3-point seat belt, so you can rest assured of a safe journey.